The last time I wrote specifically about OneDrive for Business, I wasn’t too keen on the product. I’m still not, but after attending Microsoft Ignite in Chicago a few weeks ago, I believe there may be a light at the end of the tunnel for users of this service, although that light is still several months away by Microsoft’s own admission. Let me back up, though, and say that I didn’t go to Ignite expecting to walk away impressed with Microsoft’s open acknowledgement for the issues, particularly sync related, plaguing OneDrive for Business – and yet that’s exactly what happened. On day 2 of Ignite, I rushed down to the Expo Hall to attend a session on the SharePoint community that was postponed due to a double-booking. I ended up having a great conversation with a guy named Rob who works on the SharePoint product team. Our conversation wandered a bit, and ended up turning to OneDrive for Business, at which point I basically said I had high hopes for the service, but couldn’t advocate for deploying it wholesale to my users until sync worked reliably and until some inherent limitations (20k file limit, for one) were addressed. Rob nodded his head and said he understood, then recommended that it would be worth my time to attend a session that afternoon entitled, “A File’s Future with OneDrive for Business.” I attended that session, and I’m glad I did. If you’re at all interested in OneDrive for Business, follow that link to Channel 9 and watch the video, especially the first 10-15 minutes. Right of the bat, the speaker, Reuben Krippner, asked how many people were using OneDrive for Business. There were many hundreds, and probably more than a thousand people in this theater, and every hand went up. The he said, “Ok, keep your hands up if you enjoy the sync experience” and all but a handful of hands went down. He said, “I am shocked. Whoever likes the sync experience, I got a t-shirt for you right here. Ok, now that we got that awkward moment out of the went, let’s get on with it.” This bit of self-deprecating humor at the top of the session set just the right tone for the meat of my takeaway for not only this session, but the conference itself. That’s a good thing – but what good does it do me and my users right now? As a practical matter – none. But as a factor to plan (and, frankly, hope) around, it does help. Talk is cheap, but Microsoft has acknowledged OneDrive for Business does not meet its customers’ needs, and they are committed to fixing it. More than the what, I’m hopeful about the how. 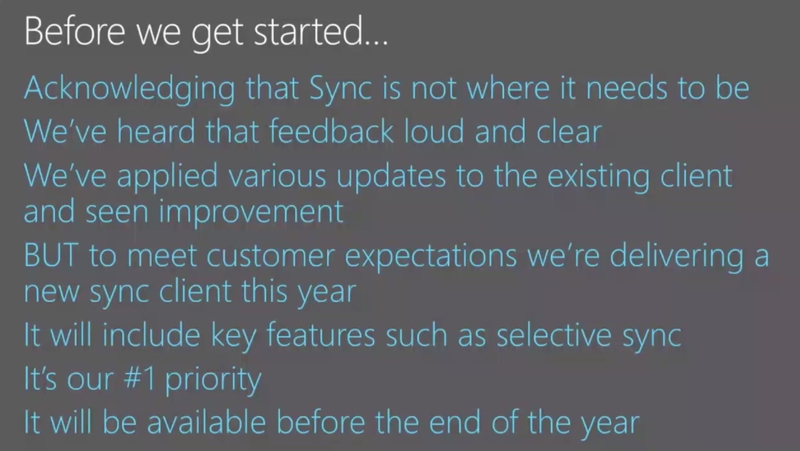 Microsoft says they’re building this new sync client based on the known-good Consumer/Personal OneDrive sync client, and as I’ve said before, that’s a good thing. They’re also building on the model they’ve already begun on mobile – with the plan to provide a single, unified sync client that works with both OneDrive Personal and OneDrive for Business. I’m not a fan of counting my chickens before they hatch, but if Microsoft delivers a new sync client that works as well as the OneDrive Personal client by the end of the year, I’ll be comfortable recommending OneDrive for Business to all of my users and they can start getting the value out of the service that we were promised over a year ago. 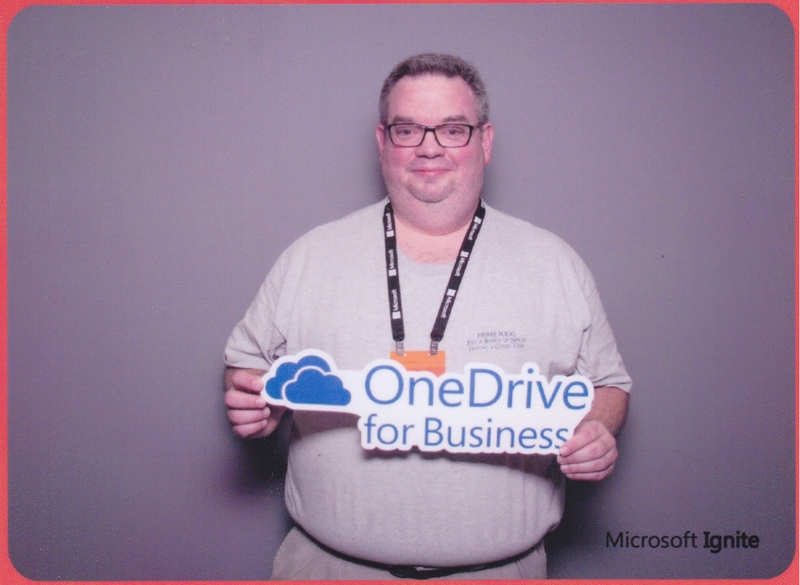 I took this picture at the Office 365 Photo Booth at Ignite and sent it to my team, partly as a joke, partly as a precursor to letting them know I was impressed with Microsoft admitting OneDrive for Business needed serious work. I’m not saying OneDrive for Business now is ready for prime time, or for my recommendation, but I do believe it will be, and I’m hopeful that will be by the end of the year. Assuming it is, expect a longer, more complex write-up on its capabilities and how I see it being useful to my organization and users. This is encouraging to hear. I’ve had a hell of a time with it for a friend of mine who is using O365 for their business and a handful of users. What’s surprised me the most is how long it’s been out and how long it’s been BROKEN. I get they are looking to do stuff but I thought it was Microsoft’s new goal to turn these things around quicker? Either way I am hopeful as you are they do something and soon. Glad to hear an update post on this one.